Angel wings and a halo for your amigurumi, The wings fit perfectly this Bear pattern that I released in 2014. There's also a full video tutorial for the bear. Of course you can use the wings for anything you'd like, you don't have to use them on the bear. The wings are 5 inches across at the widest points. donation. Thank you so very much and enjoy! working now along the edge to the left of your last st, you'll have to push your hook through, 2tog then 2tog then 1sc in the outer loop of the corner. Next, working along the outer loops of the row, 1sc in each of the 11 outer loops. f/o leaving a long tail for sewing. Weave this yarn tail back along the edge, pull the wing out straight if it got bunched up while weaving the yarn tail. 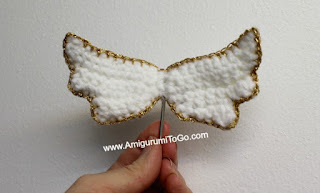 Put 2 wings together and whip stitch along the outer edges. 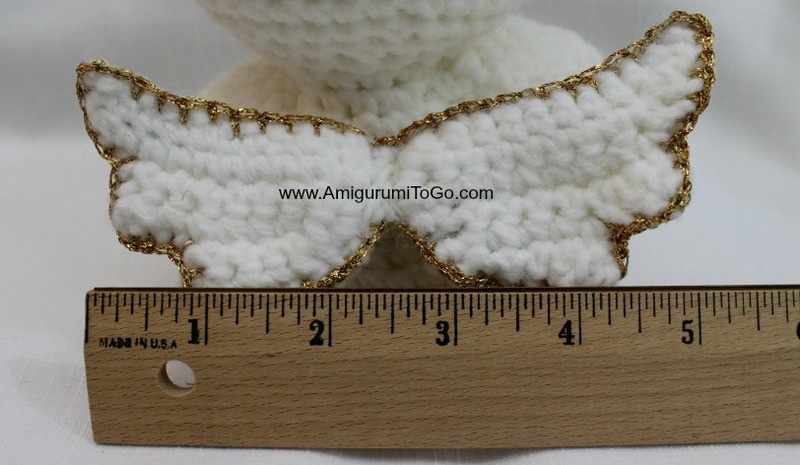 Optional ~ outline the wings with gold thread by crocheting all the way around the edge. This part can be tricky as you will have to push through both side of the wing with your crochet hook. After getting halfway around the wings I switched to a smaller, steel hook which made it easier. Halo: you can make a halo different ways, chose one that will be easiest for you. One is super easy, just use a pipe cleaner by itself, form a circle and push the ends into the head. You can also wrap wire with yellow yarn and use fabric glue one each end. Or crochet a tube or crochet 2 rows. 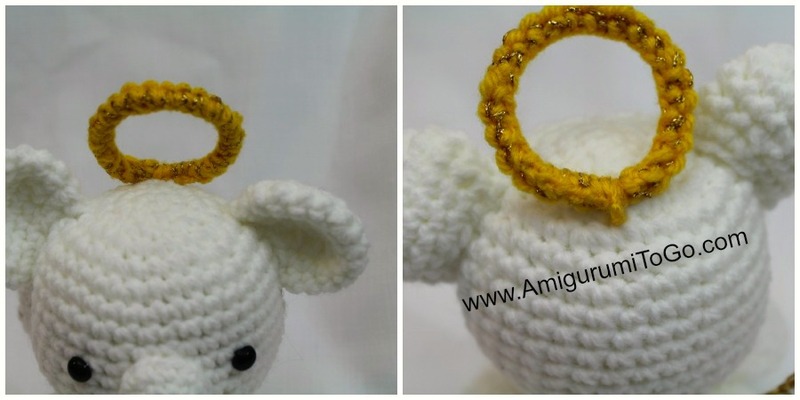 On the bear pictured in this pattern I made the halo by crocheting the rows. f/o leaving a tail for sewing. Inset a wire or pipe cleaner with about an inch or so hanging out the one end, sew the open end of the tube to the closed end. Insert the wire into the head then sew the halo to the head. Halo using rows: With yellow yarn. You can also hold golden thread along with the yarn. f/o leaving a long tail for sewing. Place a wire in the center leaving a bit hanging over on each end. Loop each end so they don't poke you while you are whip stitching the piece closed. It's a bit awkward stitching it because it's almost too narrow to close but do your best, using you yarn needle just go through the outer loops on each side and pull tight. Then bend the piece into a loop and sew the ends together forming a closed circle. Bend the wire ends, twist them together and trim. Leave about an inch or so that you can push into the head. These little wings are so gorgeous to use for the favorite animal of th children. Thanks so much. Thanks so much for sharing the wings! They would work on the Dress Me Bunny wouldn't they? Can you please direct me to a pattern for this bear? 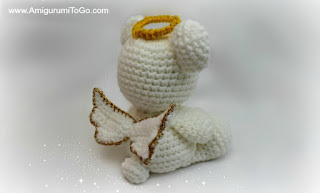 I would absolutely love to make this in memory of the child that I just miscarried. Thank you in advance. yes, it is linked in the description, at the top of the page just under the first photo. I am so very sorry for your loss. The bear you see in the photo is the one I made for my niece who also suffered a miscarriage earlier this year. Thanks for your patterns. The only one I've tried is your big foot turtle. It, and now that I've made four of them for my grandsons, was my first attempt at crocheting amigurumi. I'd love to send a picture but I don't know how. I still wanted you to know how much I appreciate your YouTube videos. Thanks again. that's so awesome! I'm glad you are enjoying the patterns, that means a lot. First time noticed but on fourth row we have 10 st. Skip 4 than sc 6.... than 2tog. What am I missing?? I must have just "fudge" my other two. no, there's not 10st in the 4th row. The 4th row has 8. Ohhhhh gosh sorry didn't see you had video and you count the chain stitches was my problem. Thanks you amazing designer. I love Sharon's patterns, but can't find a larger snowman..;O(...My daughter sent me a photo of one she would like, but I can't find anything like it, except the bear pattern is close, so I'll have to change body to make the snowman.....hopefully, you will make a pattern for one that size.